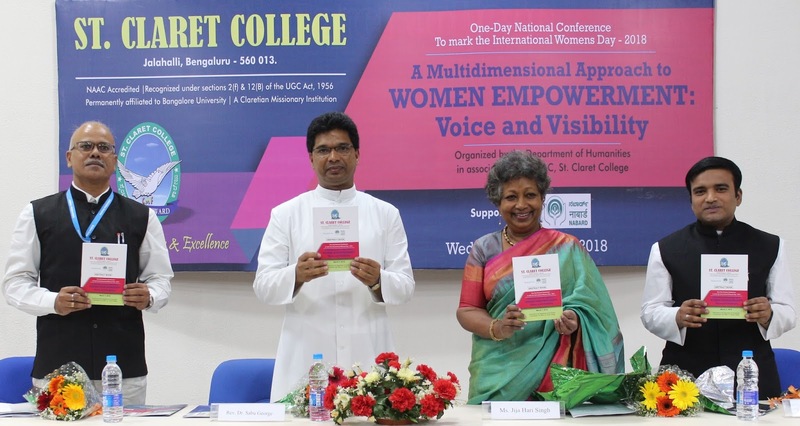 Bengaluru, March 7: Women empowerment and women equality are highly contextual and complex issues which are two sides of the same coin, said Dr. Jija Madhavan Harisingh, former DGP, while inaugurating a NABARD sponsored national conference ‘A Multi Dimensional Approach on Women Empowerment: Voice and Visibility’ at St. Claret College, Bengaluru on Wednesday. Addressing the conference, Rev. Dr. Sabu George, the Principal said, “Only in developing countries, women are taking part in the political decision making, whereas in developed countries women are not given such an opportunity”. More than 100 delegates from across the Country took Part in the Conference and deliberated upon the Conference themes. Altogether 70 Papers Presentations were made during the day. Rev. Fr. Vineeth George, the Vice Principal; Mr Triyoginath Pandey, Conference Convenor and the HOD of the Department of Humanities, and others were present on the occasion. Rev. Fr. Vineeth George, the Vice Principal of the St.Claret College.